LOTD – Tell me how does it feel? I was going to call this look “Blue Monday” because I started putting it together on Monday. went with a lyric from the song. Hope your Wednesday is not so blue! Poses: Estetica – New pose pack coming soon! *waves frantically* Hey it’s been ages since I had time on SL – RL is all consuming at the moment. great cable knit tights from Jane. a bag from The Secret Store, jewellery from Maxi Gossamer, and sunglasses from Mon Tissu. The phone pose prop set is from my store Estetica. We’ve had a lot of grey days here lately, but today is sunny and clear. Happy autumn, everyone! 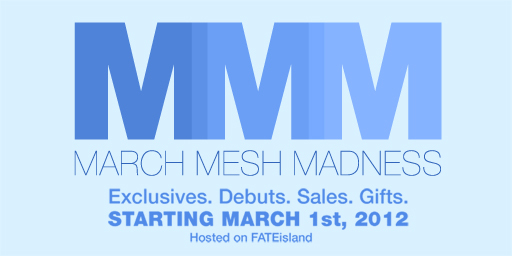 More newness from March Mesh Madness in today’s look. I started with this cute jacket / tube combo from coldLogic. I like that you get the pieces to wear either together or separate. There are 8 colour combinations, and in each you get the jacket, tube top, and the 2 pieces together. I paired it with the coldLogic Mazza trousers for a delicious strawberry and chocolate combination. I was very excited to find mesh jewellery at MMM! Maxi Gossamer has a line of inexpensive mesh jewellery. Buy the fatpacks of 4 colours for the best deal. I’m wearing the Pearl Daisy necklace in blood pearls (black and red). With this set you get a long/short necklace (shown), a short and a medium length necklace, and matching ring.